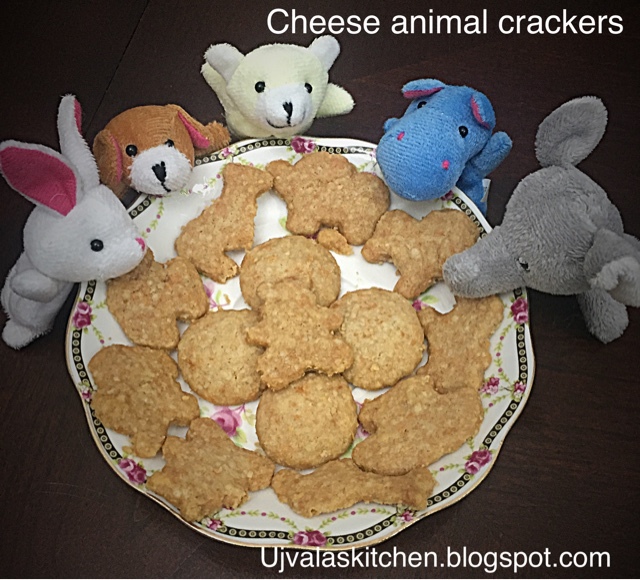 Easy,quick and yummy crackers. I have animal cookie cutters, and so the name :). You can use any shapes that you have. 1. Blend all the ingredients in a food processor to a course dough. 3. 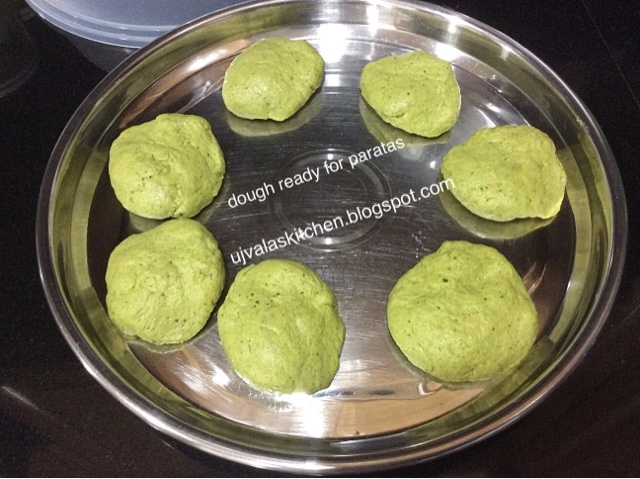 Roll out the chilled dough as if you are making rotis. 4. Cut the rolled sheet to the desired shapes you like. 7. 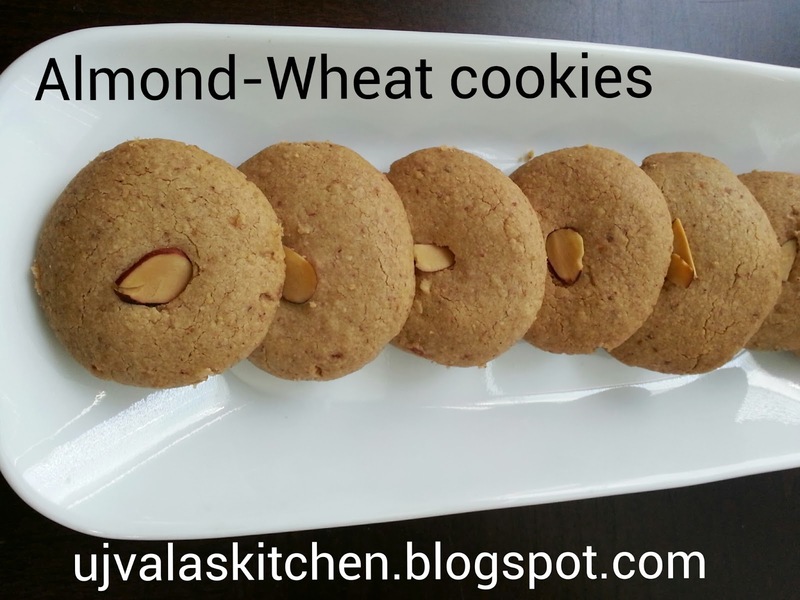 Bake them for 25 mins or until golden brown. 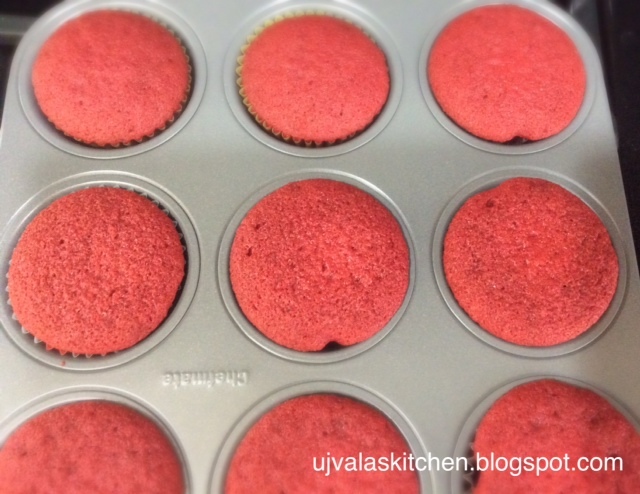 Once done, remove the tray from oven, let them cool down completely before storing in your fav container. 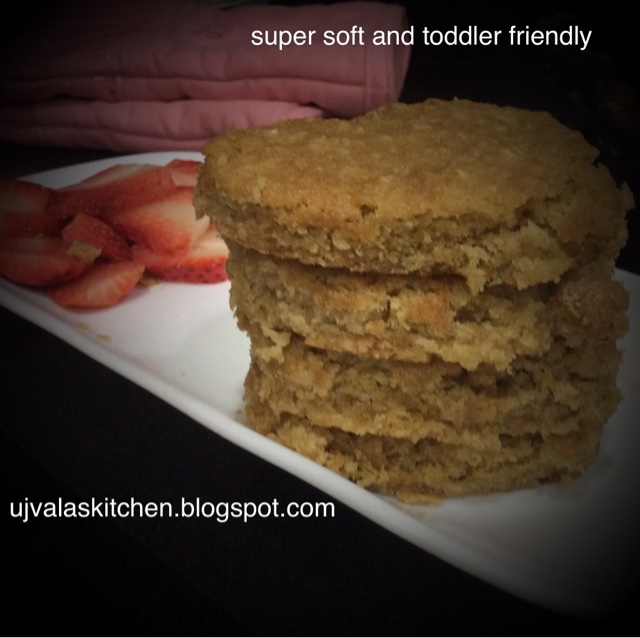 I have been trying different tastes to satisfy my little handsome and this is one of those trials, and i can say this as toddler friendly, as my LO loved them - purpose fulfilled! 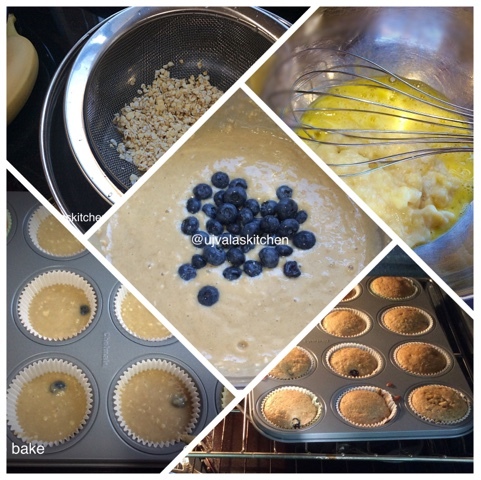 This recipe yielded 14 medium muffins. 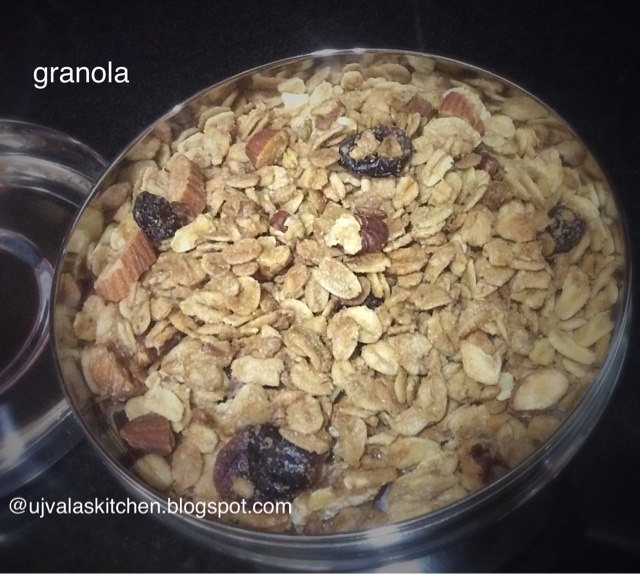 I always rinse oats with plain water, you can skip this if you dont want. Keep aside. Mash the bananas. Add eggs and whisk the mixture. 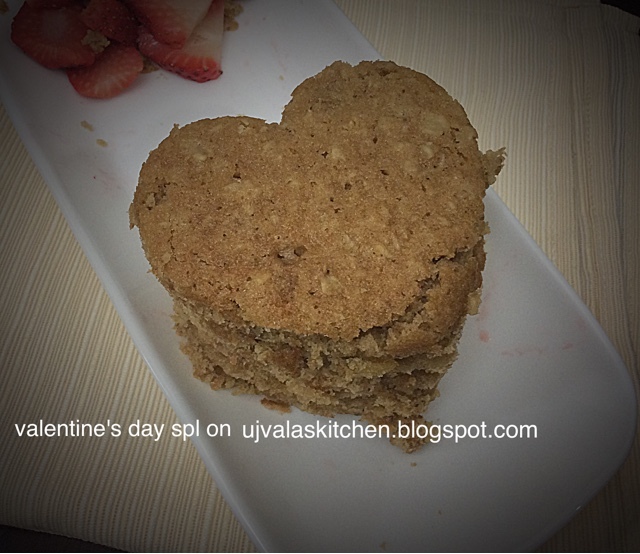 Add the yogurt, warm milk, sugar, melted butter, rinsed oats, flour and mix well. Add the baking soda at the end and then add blueberries, mix well. 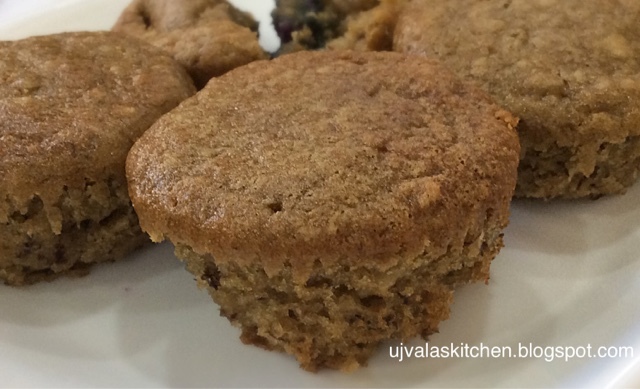 Meanwhile, pour the batter in muffin pan (muffin liners are optional), bake for 25 mins or well done. 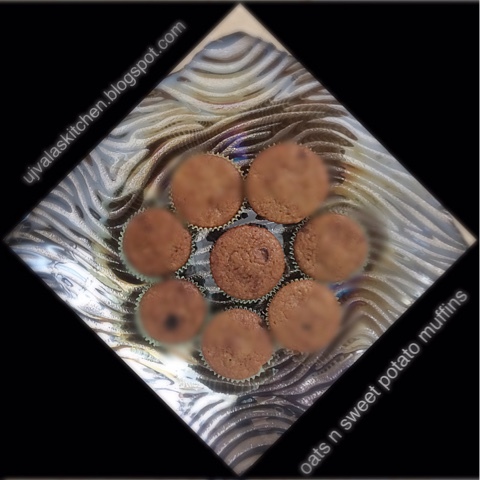 A simple fork test is good to test if it is done - if the fork comes out clean, means muffins are done. 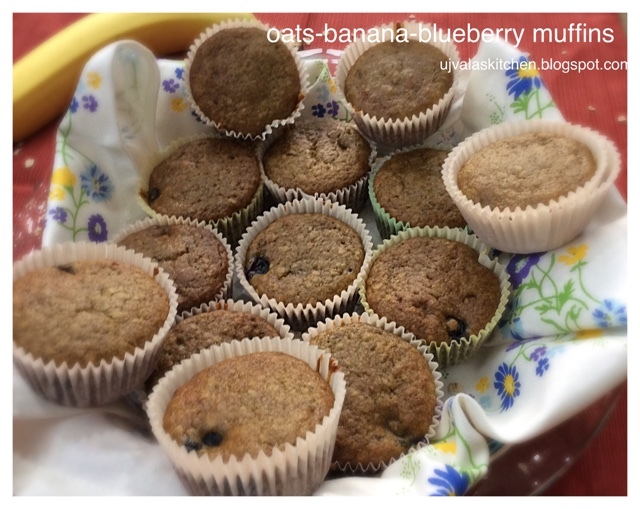 Let the muffins cool down a few minutes before serving your little ones. 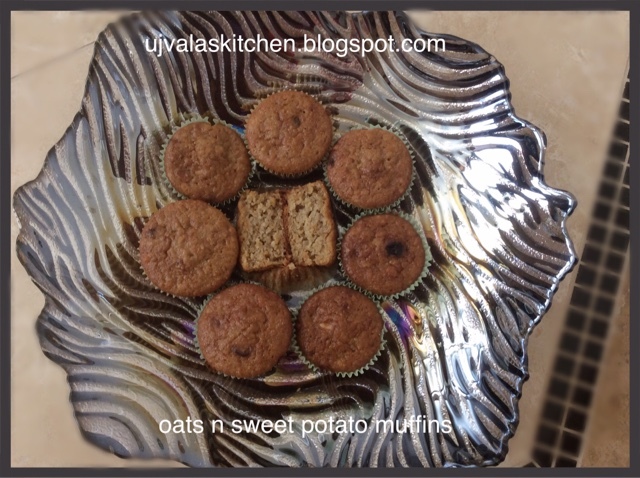 By the way, forgot to tell you - i made these for breakfast, but you can even pack them as snack. Its been a while and i update this post with a few changes. Brown sugar - i measured it as 1/8 th cup for each cup of oats. 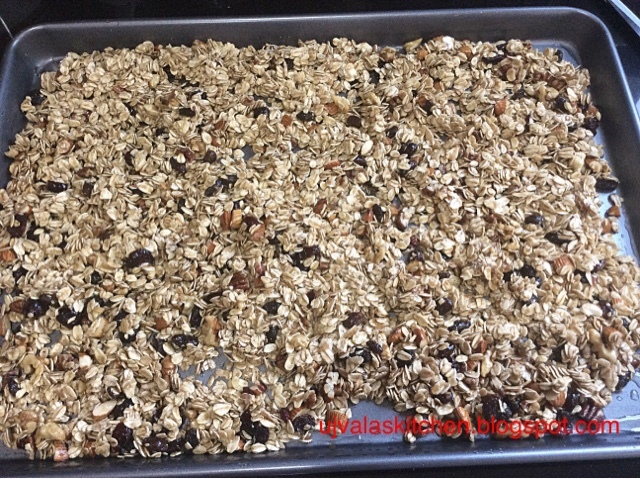 Since i took 3 cups of oats, i used 3-1/8 th cups of brown sugar. 1. 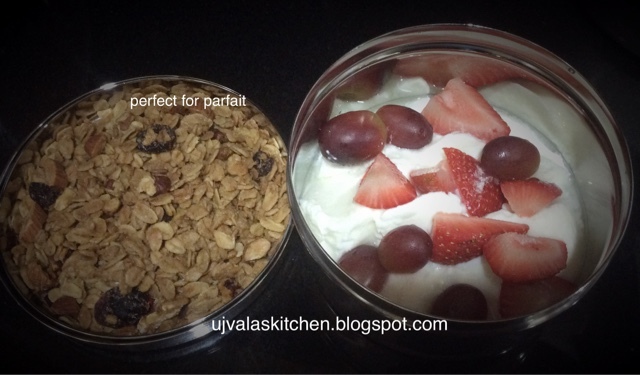 Take oats, nuts, cranberries in a mixing bowl. 2. Chop ur nuts either with hands or in a chopper, mix them together with #1. No need of step 3. 4. Pre heat oven to 325 F.( more or less based on ur oven). 5. Mix well all the ingredients except black raisins in a big bowl. 6. Grease a pan with some oil/ butter if u like and spread the mixture on the pan. 7. Bake in oven for 35 mins, stirring 3 times every 12 mins or so. 8. Add the black raisins after 24 mins, give it a nice stir and keep it back in the oven. Make sure to stay safe while stirring occassionally - u can take out the pan, stir and put it back in the oven. 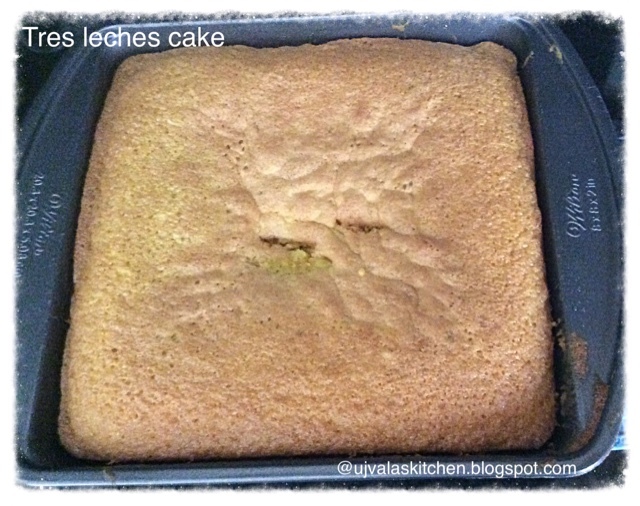 After 35 mins, take out the pan, let it cool down and transfer to an air tight container.. I have to see how long it stays fresh for my parfait. You can have it either with milk for breakfast or with yogurt for snack. You can use this in several recipes including gulab jamuns to cakes. 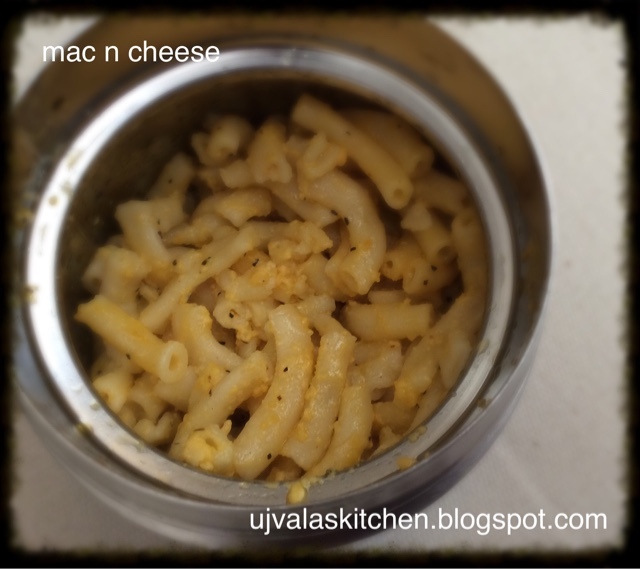 Will update more recipes with mawa soon. Preparing mawa needs lot of patience. 1 gallon of whole milk yielded about 250 gms of mawa. It took me around 3.5 to 4 hrs to get this mawa. -->Take milk in a heavy bottom pan with flame on number #4 (i guess, this would be somewhere between low to medium if ur stove doesn't have numbers). --> i have placed 3 steel spoons inside the vessel before pouring milk. (Tip From online resources) to avoid milk sticking to vessel. --> keep stirring preferably with a wooden spatula. 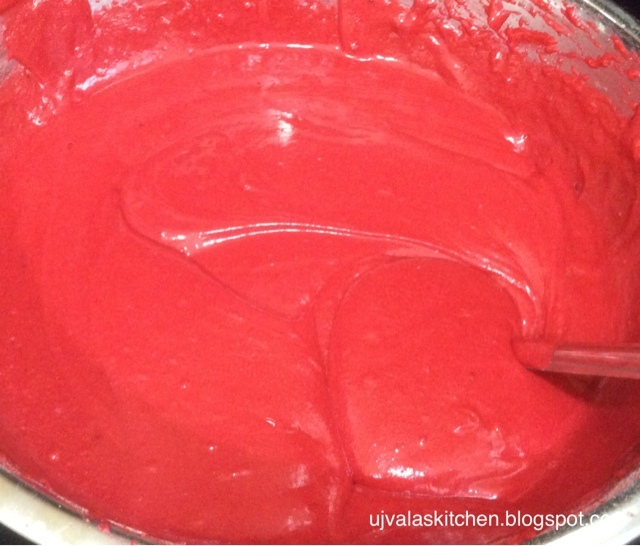 --> continue stirring until it gets thick and rigourously stir once it gets thicker n thicker. Like i said, one need stamena and patience to get to the most purest/ tastiest form of milk. 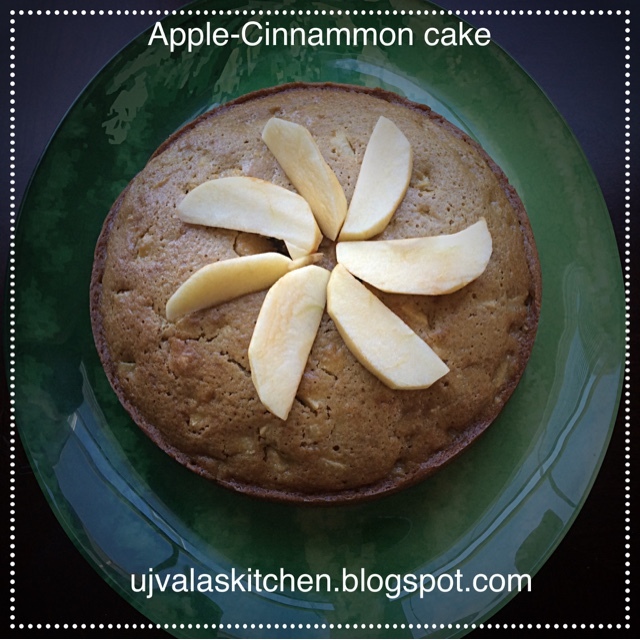 I made it as unsweetened, but if you add sugar, you and enjoy as it is. 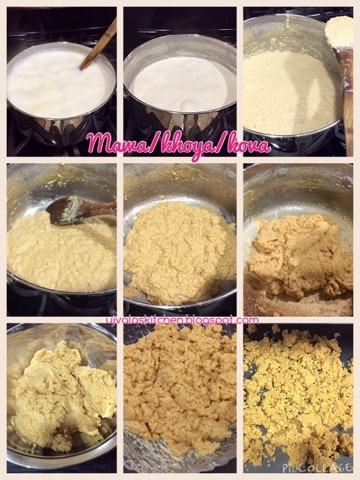 Once it gets thicker in consistency as shown in the pics, u can let it dry completely and then store it in fridge/freezer based on how frequent you use the mawa. Finally, yehh, i made mawa!! Mix all the ingredients to make a smooth dough. Roll each patty flat until 1/4 th inch thick and cook them on tava/griddle until well done. 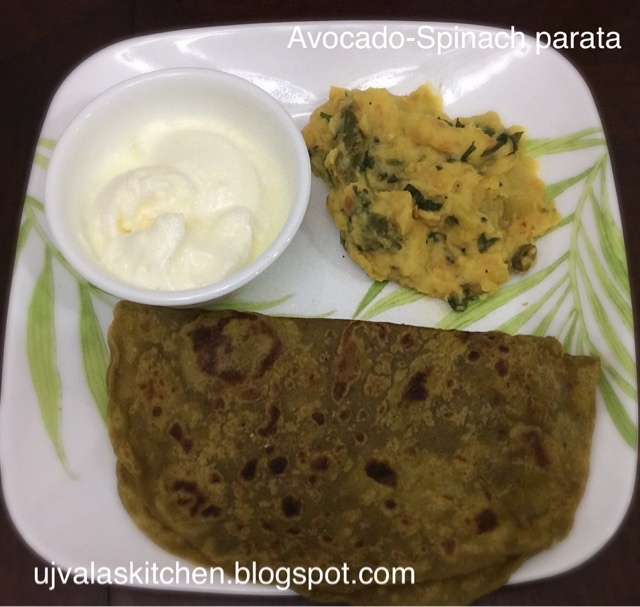 Healthy and tasty avocado paratas ready to serve. 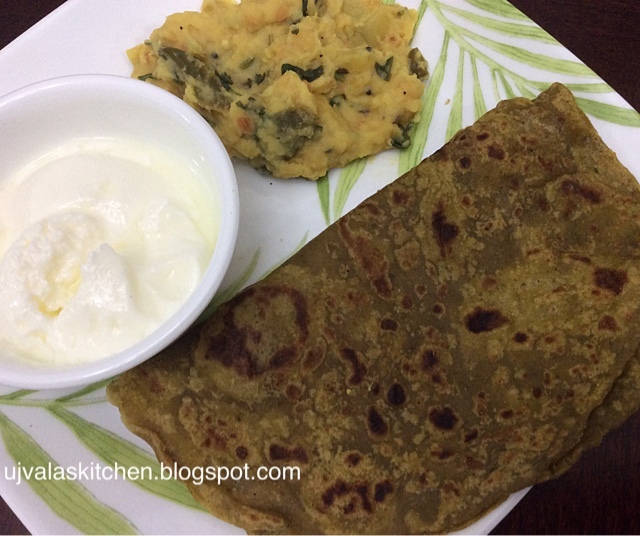 I like having rotis/paratas with some kind of dal and yogurt. So, i made mango dal. The bland avocado blended well with tangy mango dal, melted in the mouth with chill yogurt :). Yes, the most popular traditional french treat with a twist of orange flavor. And most importantly, my little toddler's favourite cookies 😍. We usually enjoyed store brought till now but not anymore 😉. 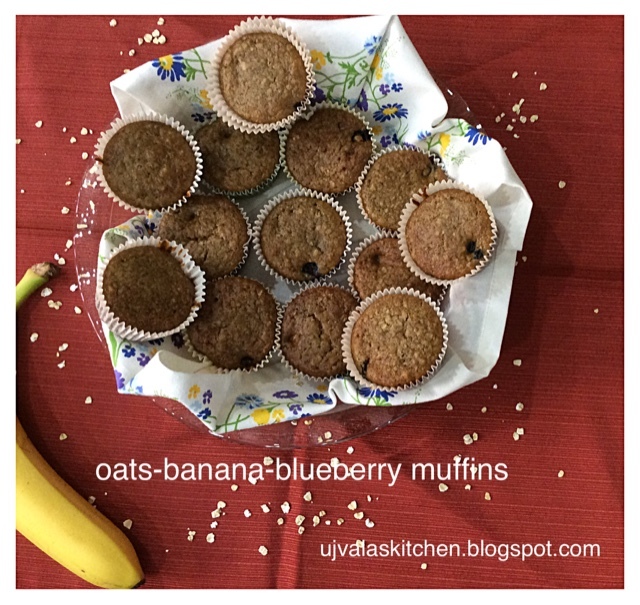 Super easy, yummy and quick recipe. Usually this recipe contains vanilla extract but i skipped it. 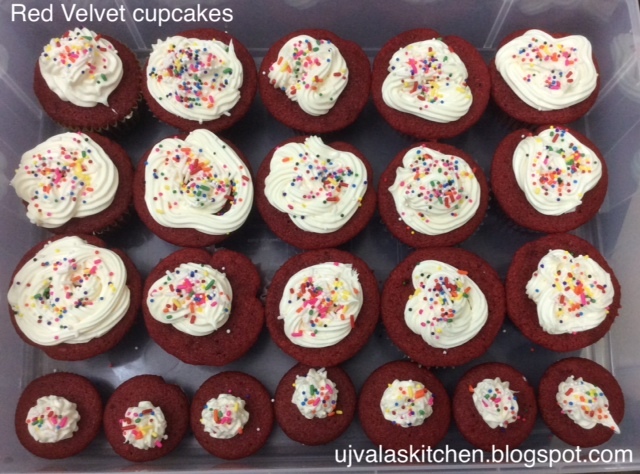 For sweettoothers like me, u can even have them during tea time as well but they will be on sweeter side though! 1. Beat eggs and sugar with hand mixer until you see creamy texture. 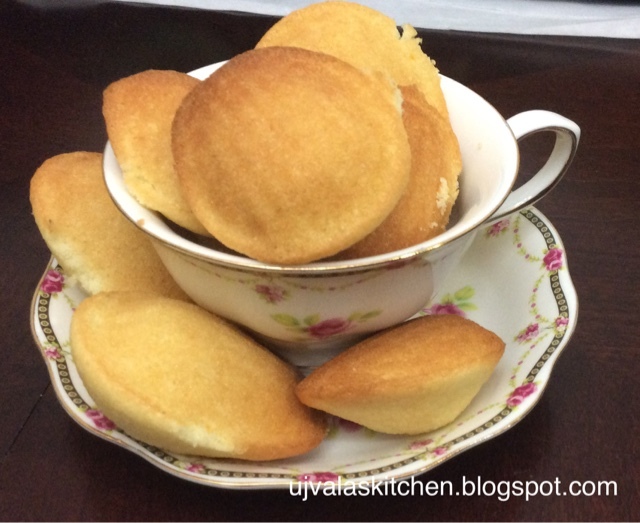 Well beaten is the key for soft madeleines. 3. Sift the flour and tuck in the flour little by little and mix well. 4. Add the orange zest, cardamom powder and baking powder; mix with a spatula. 5. 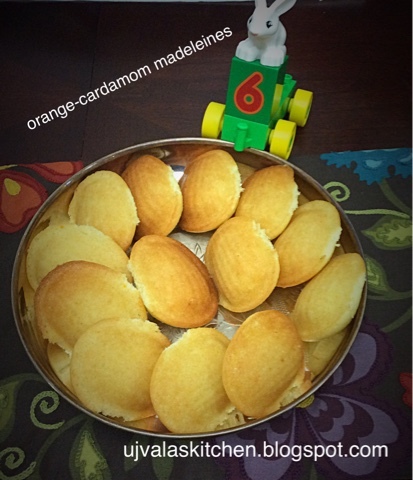 Pour the mixture into the madeleines molds/pan. 6. Preheat the oven at 450 F and bake for 4 mins and then reduce the temp to 350 F and bake for 4 more minutes. This helps the batter raise at high temp and then slows down giving the nice bulgy shape to cookies. Temp varies from oven to oven - so please keep an eye to avoid burning. Once the cookies are done, u can let them cool down before enjoying. Boil the raisins (until they become fluffy) in a open pot with some water, strain and rinse with cold water to cool them down. In a mixing bowl, beat the eggs, butter and sugar with hand mixer or a hand whisk will do. 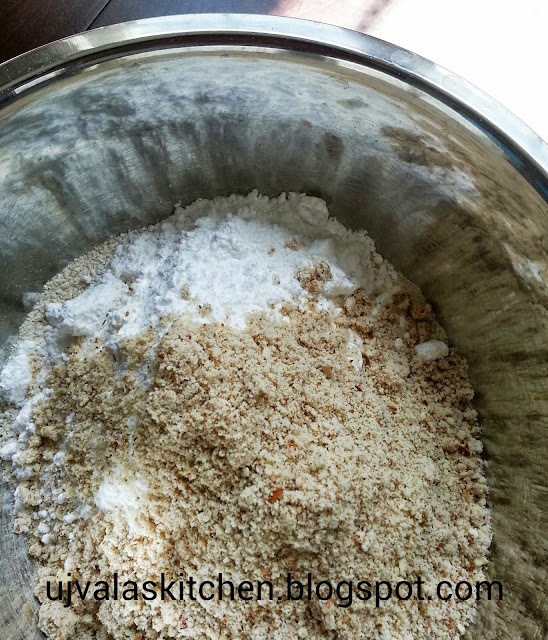 Sift the flours and add it to above mixture. 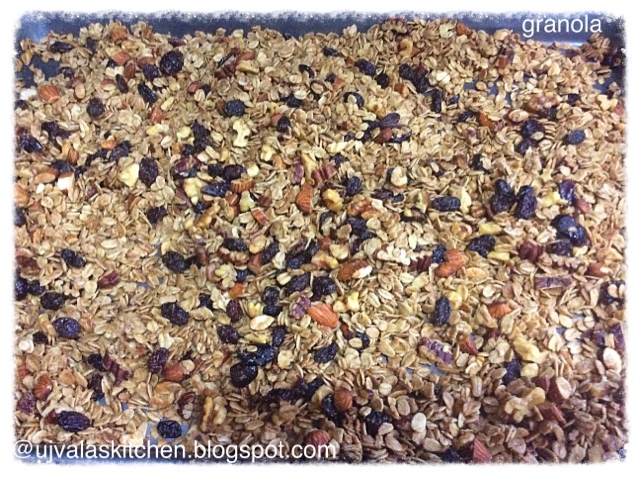 Add the rinsed oats, boiled raisins and mix altogether. Set the oven to 360 degrees F.
Grease a cookie tray with some melted butter and spread the mixture on the tray about 1/2 inch in thickness. Bake for 12 mins or until done. 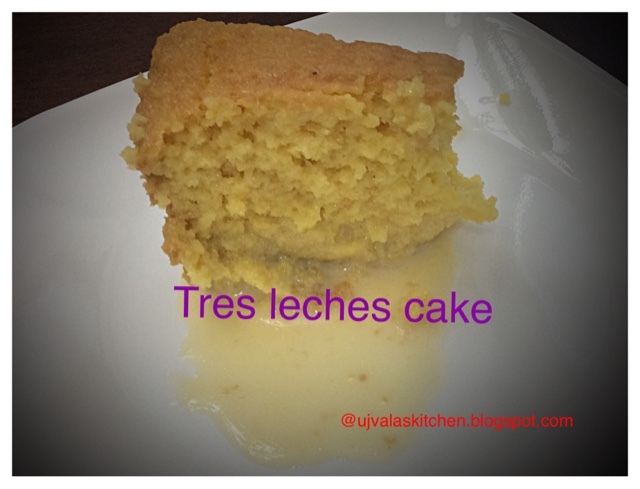 A toothpick or fork test can be done by poking at the middle of the batter to check if its done. If the baking is done, no batter will stick to the fork. Once it is done, take out the tray, cut the shapes u want with cookie cutters, let them cool down and enjoy 😀. My husband and my little naughty son both liked them a lot 😎 and i am happy as they are 😄. Cashews, raisins, shredded coconut(optional) to garnish. (1) a. Soak moong dal for atleast an hour. (helps to cook fast). b. 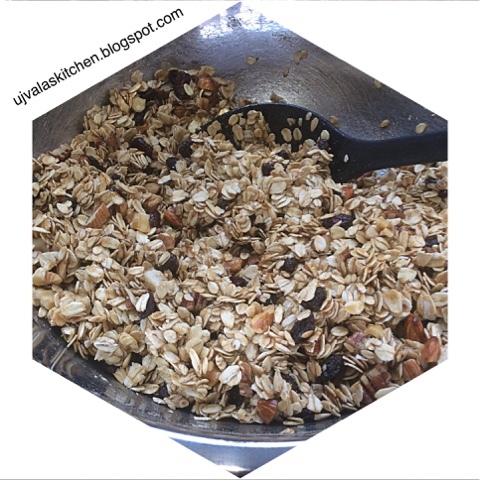 Optional - clean/rinse your oats and strain. (2) Boil water in a bowl/saucepan and add soaked moong dal to the boiled water. (4) Meanwhile boil milk and add boiled milk to step (3). 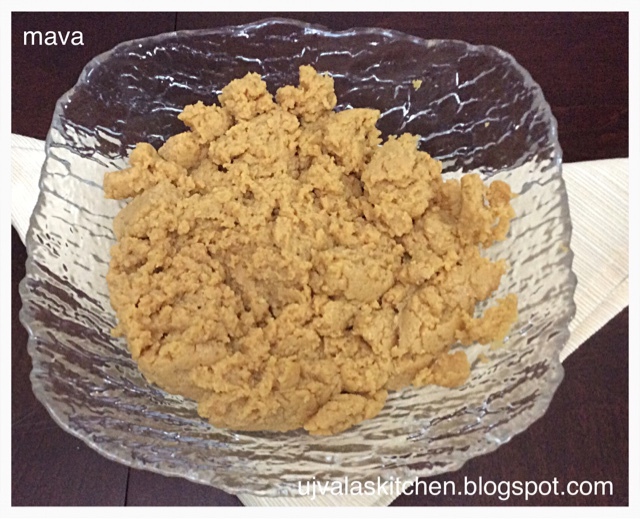 (5) Add jaggery and cardamom powder as well and let it cook for a few more minutes. (6) Take a tbsp of ghee in a separate pan and saute cashews, raisins and coconut until golden brown and add it to pongal. Once the pongal is completely cooked, turn off the flame and serve it warm to God/guests/kids :). Tip : Adding boiled milk to pongal reduces the spill hassle. Finally, got a chance to update my blog after a very long time. I was almost about to forget that i have a blog that i need to take care of along with my sweet little darling 😍. 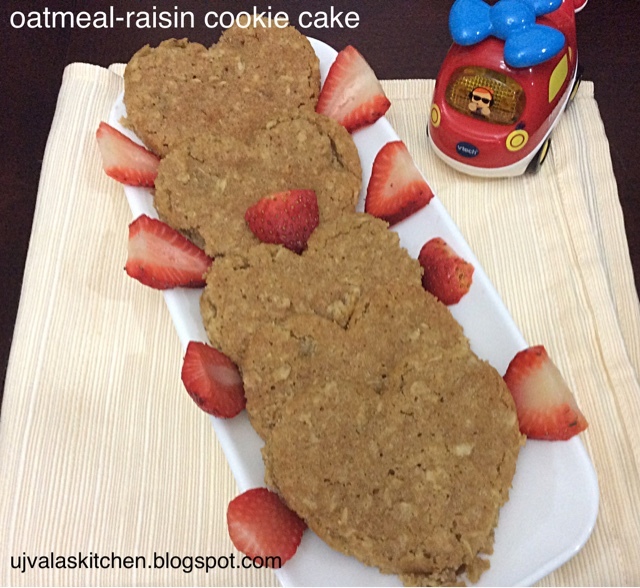 These are very easy to make/bake and my lil darling loved it 😊. 1. Whisk eggs, brown and white sugar. 2. Add milk, flour, oil, oats, shredded sweet potato and mix well altogether. 3. 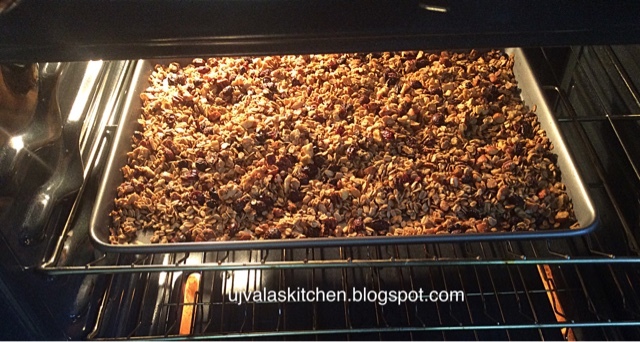 Now tuck-in nuts, cranberries, cinnammon and cardomm powder. 4. Finally add baking powder and baking soda and mix the batter. Do not overmix after adding baking powder and baking soda. 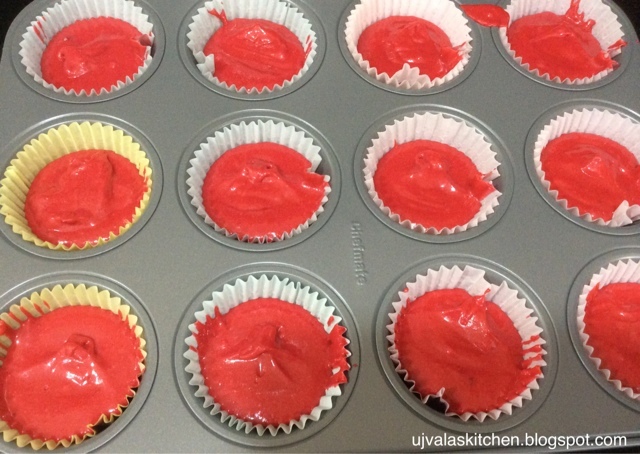 Add muffin liners (optional) to muffin pan, fill each liner upto 3/4 th (leaving some room for the muffin to rise). 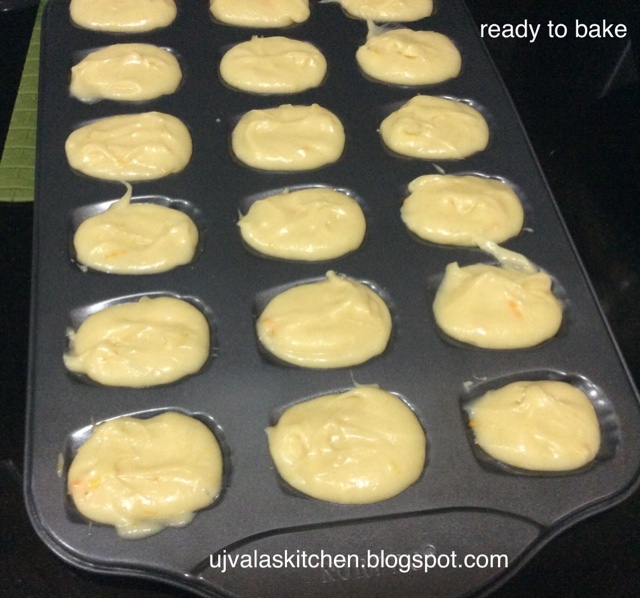 Bake them for 30 mins. 2. Mix well the batter by adding each ingredient one by one. 3. 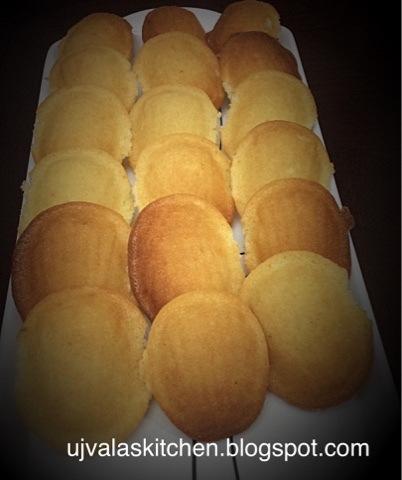 Add the liners to cupcake pans and fill in the each liner with the above batter. 4. 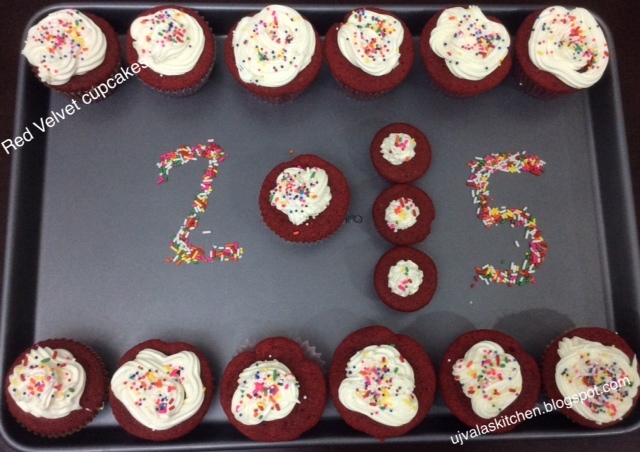 Bake them for 20 mins at 360 degrees F.
I had been watching giada's shows and this caught my attention. Wanted to give it a try and it turned out delicious(with slight changes)! Thanks Giada :). 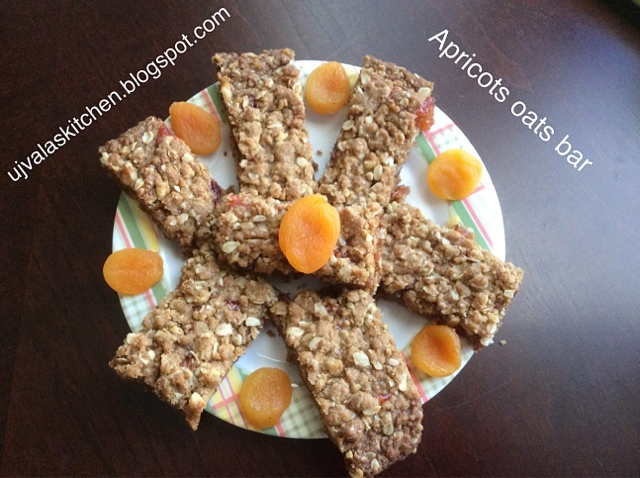 In a small bowl, mix the 2 jams and chopped apricots. In a large bowl, whisk egg; add flour, sugar, cinnamon and baking soda. 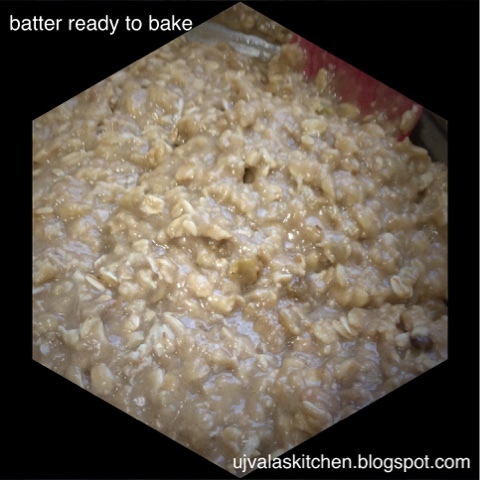 Add butter, walnuts, oats, vanilla extract stir the whole dough until well mixed - this will be ur crust mixture. Preheat oven to 375 degrees F (based on ur oven make). Spread half of the crust mixture in a 11x9 in pan. With a spatula, spread the jam on the crust leaving 1/2 inch border around the edge of the crust. Cover the filling with the remaining crust mixture and spread evenly; slightly press to flatten. Bake for 30 mins, until golden brown. Remove from oven and let it cool for atleast 45 mins (if you do not press the crust hard enough before baking, bars will become soft textured and might break down). Store in air tight containers for 3 to 5 days. 2. Meanwhile chop onions, green chillies and basil and cilantro. 3. Saute all the ingredients with 5 tbsp of oil. 4. Add cooked rice and toss altogether. 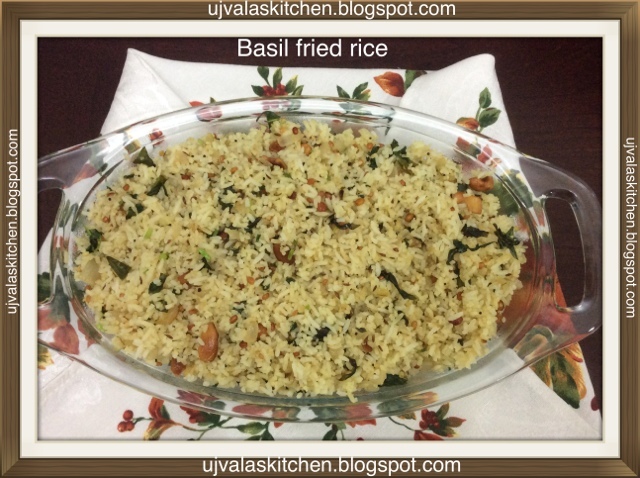 Thats it, yummy and quick rice ready. After a long time, i tried this party hit dessert :). Here i want to share the simple and damn easy process. 1. Clean and dry strawberries. Preserve the crowns. Chop the banana into round slices. 2. Freeze banana slices in freezer for atleast an hour. 3. Add 1 tbsp of oil/butter to chocolate chips and microwave for 2 mins(little less or more based on power of ur microwave). 4. Now, dip each of the strawberry in chocolate and then in nuts and let it set on a wide tray. Repeat the process for frozen banana slices as well. 5. 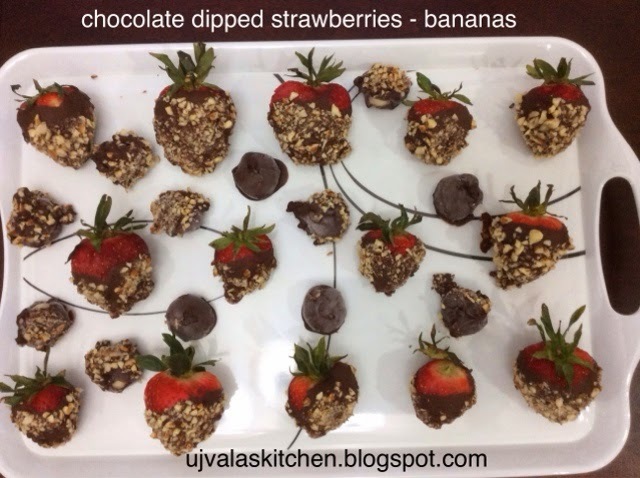 Refrigerate all dipped strawberries and bananas for an hour or until chilled. Thats it, yummy choco dip strawberries and bananas are ready. PS : if microwave is not available, you can use traditional method for melting chocolate. For this, take about a cup of water in a sauce pan. Place another vessel on top of it, make sure the top bowl does not touch water in the sauce pan. Pour chocolate chips in the top bowl, switch on the flame and keep stirring until the chips melts. 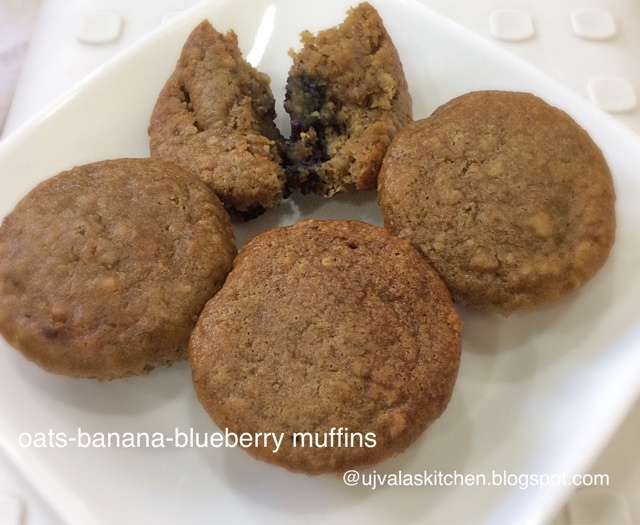 Hi All, today i came up with zero-butter yet healthy/tasty recipe! Try it and enjoy the taste. 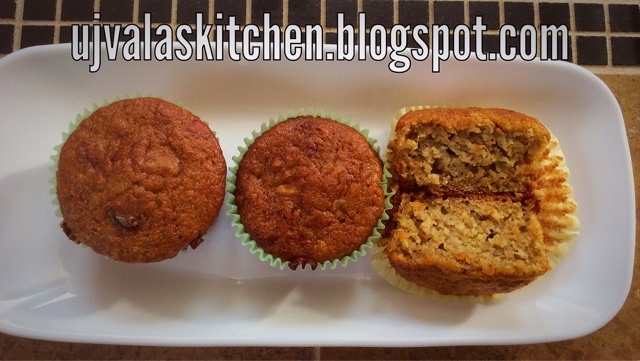 You can add dash of baking powder if you want but not necessary. 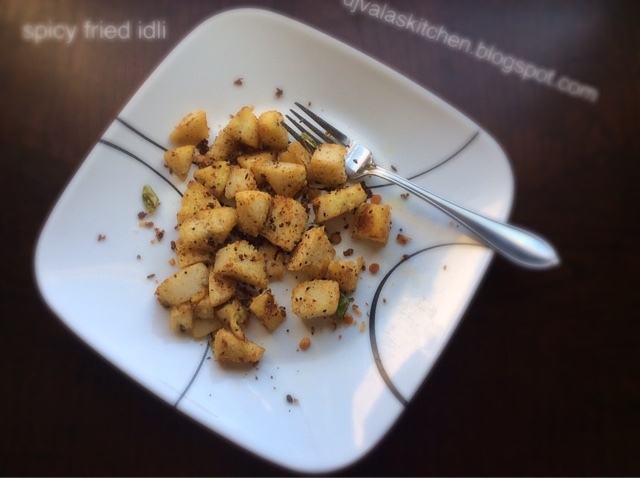 --> Blend almonds into coarse powder. 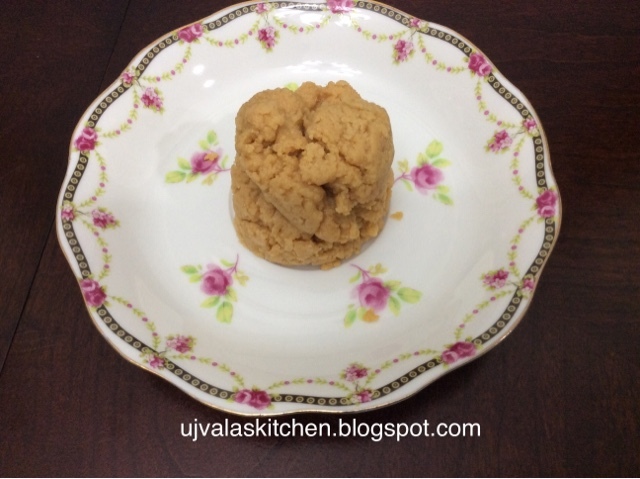 --> Take wheat flour, coarse almond powder, sugar, cardomom powder and toss the entire mixture by adding oil slowly and make it as a dough (dough should have the consistency as we make dough for rotis). 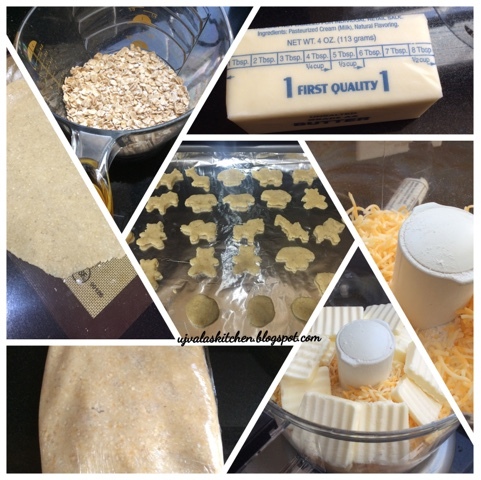 --> Now make into small pattis (and stick in sliced almonds into each patty - optional). --> Set the oven temperature to 360 degrees F.
--> Meanwhile, place each patty on a wide pan leaving about thumb size gap among cookies. Tip of the day - Place Parchment paper OR use re-usable baking sheet inside the pan instead of applying butter/spraying oil (i use re-usable baking sheet). 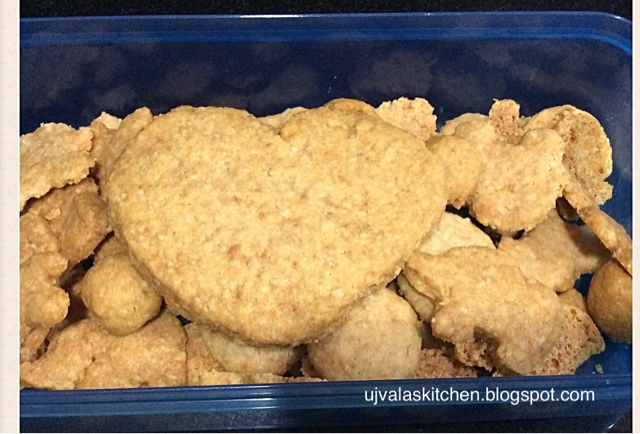 --> Bake cookies upto 25 mins (less/more according to your oven). 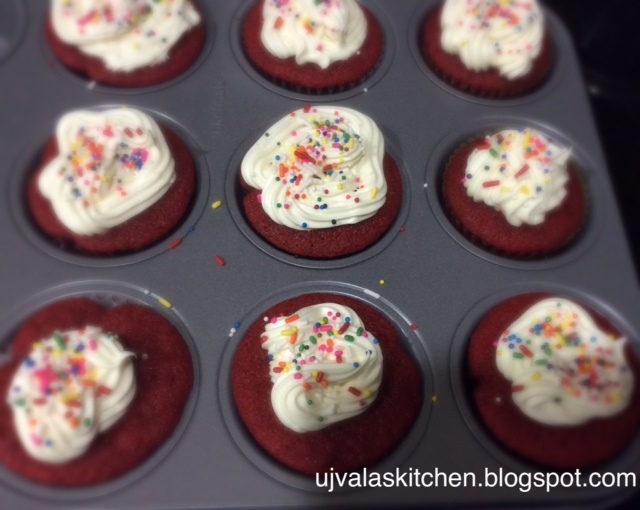 --> Once they are done, take out the tray, let them cool down for few mins. 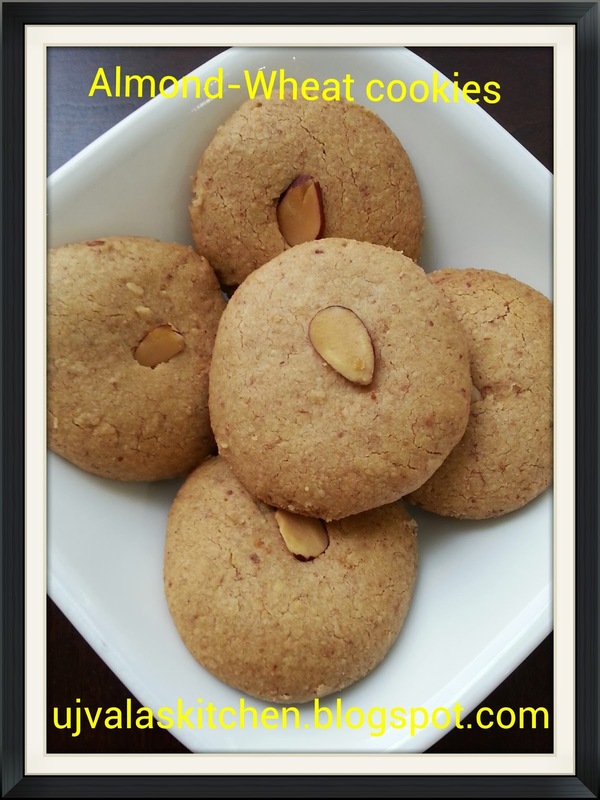 --> Thats it, yummy/healthy guilt free cookies ready to enjoy. 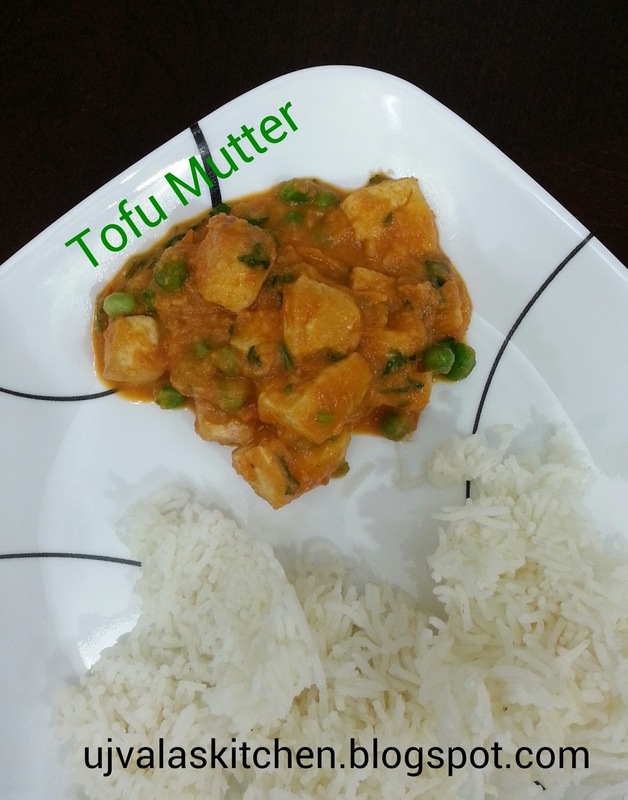 --> Prepare tofu by draining away excess water from tofu. (Please refer to #7). --> 1) wash frozen peas and set them aside. --> Now your tofu should be ready without excess water. 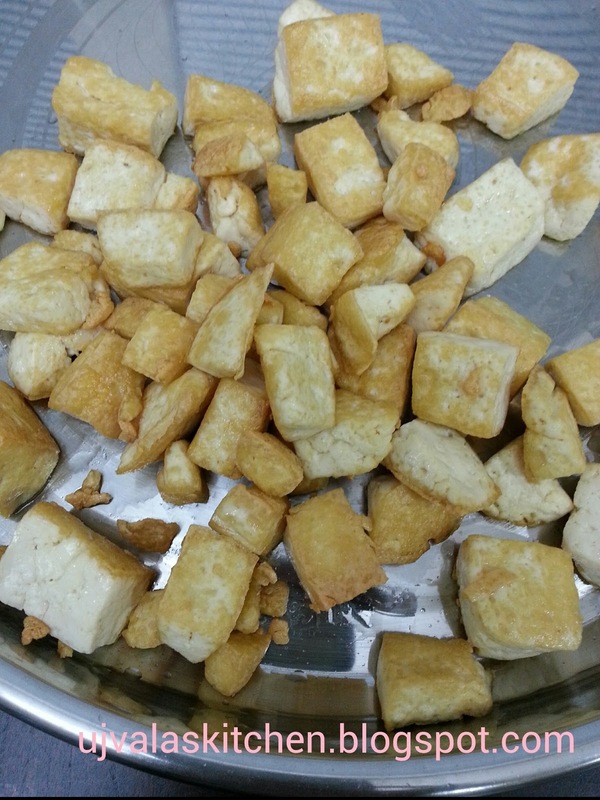 --> Chop tofu into cubes and saute them first with oil enough for saute. Set sauteed tofu aside. --> In the same pan, saute chopped onions until slightly tender - add ginger-garlic paste, add salt. --> Add kasoori methi, rosemary, cardamom powder. --> Let the mixture cool down and blend it to coarse gravy. --> Pour the gravy in pan, add peas from step (1), add red chilli powder, add sauteed tofu; Stir altogether and cook for few minutes on slow flame. --> Finally garnish with cilantro and serve it hot (don't forget to switch off the flame ;) ). This curry blends well with rotis, but as am lazy, i just serve with white rice!